When last we left Adam Reczek, the local tunesmith had just released his 2009 debut album, The Window Seat, to less than enthusiastic acclaim. The disc revealed Reczek as very much a work in progress. Though he was a gifted and polished guitarist, his songwriting bore the marks of inexperience, failing to measure up to his ambition. In addition, his vocal performance was wildly inconsistent. Despite lofty melodic ideas, Reczek’s debut was, frankly, kind of a mess. The silver lining? Each of those deficiencies is correctable. Songwriting often improves with age and experience. Self-confidence can stem a reliance on musical influences. Increased attention to breath support and phrasing can cure failings in pitch. As a songwriter and singer, Reczek may not be a natural, but he’s hardly a lost cause. He has talent, and his sophomore attempt, The Fork in the Road EP, suggests he is beginning to realize his true potential. The EP opens on “Scotch & Cigars,” an impeccably played acoustic instrumental that reaffirms Reczek’s ace chops. Sparse and pretty, it proves the songwriter can conceive of and execute compelling musical ideas, at least on guitar. “September Song” features Reczek’s first vocal performance on the disc. With improved focus and confidence, his efforts immediately outshine almost anything on his debut. Reczek is still frustratingly hesitant at moments, but most of the time his tone is pure and unwavering. On “October Song,” he comes close to bridging the gap between compositional and lyrical talents. The song features a sparkling progression and an expertly delivered instrumental bridge. Though Reczek’s poetry occasionally flirts with cliché, his writing is generally sharp and effective, expressing a charming, wide-eyed optimism. “Hold On to Hope” closes the EP, with mixed results. Again, Reczek’s arrangement is impressive. The man knows how to put a song together. But he stumbles lyrically, delivering predictable, overly earnest musings on love and hope. This is also his weakest vocal turn, bouncing around a scattershot melody as though he couldn’t decide which octave best suited him. Consistent with the EP’s title, Adam Reczek seems to be at an artistic crossroads: He still has a way to go before he can truly be considered among the area’s rising songwriters, but his improvement here suggests he’s willing to put in the work to get there. 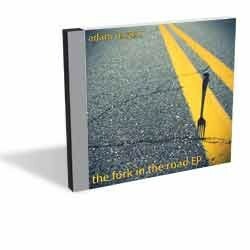 The Fork in the Road EP is available at iTunes. Adam Reczek appears as part of this week’s Burgundy Thursday series at Parima.